Mental health problems should not be thought as a normal aspect of ageing. If it does develop, it can be improved on. Researchers believe that many of the supposed age-related changes that affect the mind, such as memory loss, are actually lifestyle related. Remember, the brain is a muscle. 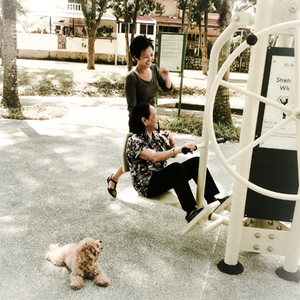 We'll bring the elderly for walks to get some fresh air. If they prefer, we could work out at senior fitness corners or play catch. We'll bring out the board games, word games and the like. Are they game? If they're in to music, we can introduce them to some basic ukulele techniques. If walking to do marketing and buy lunch is exercise, count on us too.